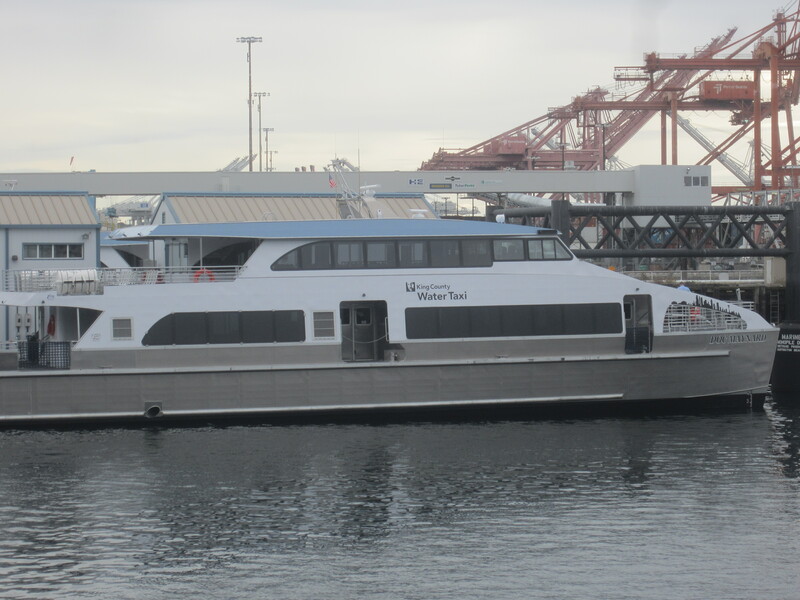 There’s a new addition to the water taxi fleet, and some much-deserved recognition of our own Doc Maynard, an early resident of Duwamps — which he renamed Seattle to honor his friend Chief Seattle. Arriving in 1852, Doc Maynard hosted the first post office in his store. He was friends with the Duwamish, and convinced tradesmen, and settlers to reside here including a ship captain’s wife, Mary Anne Conklin, (a.k.a. Mother Damnable), who ran a hotel and brothel. Doc Maynard knew the town would grow. Most famously he convinced Henry Yesler to place the first steam-powered saw mill on Elliott Bay. Maynard and Carson Boren made room for Yesler’s Mill on the waterfront. Walking around Pioneer Place twenty-something years ago, one would remember Doc Maynard’s as a live music venue. It was one of several affordable clubs to enjoy on a bar-hopping night– very much in the spirit, and personality of Doc Maynard. Now, the “saloon,” owned by the Underground tour, is a private venue used for arranging the tour groups–it serves no alcohol. The city of Seattle remembered Doc Maynard with a couple of street names. Six blocks in Chinatown between 6th and 7th Ave, are Maynard Ave S., and there’re a few blocks in Georgetown too, but it seems fitting that Doc should be back on the waterfront of Elliott Bay. In Seattle on 9/11/2001 we had a blue sky morning just like they had New York. I remember the public radio announcer being unclear as to whether the commercial plane crashing into one of towers was an air traffic control error, or a terrorist attack. For most of us, the story unfolded with terrible news updates all morning and afternoon. Our usual jet traffic over Capitol Hill and the Central District was halted. I remember seeing other parents as we brought our kids to school. One father asked me anxiously, ‘Did you tell your daughters what’s happened?” and I said that I had. Others decided not to tell their kids that morning. Perhaps they wanted to protect them, but I remember telling the news to my daughters because I thought even though we didn’t understand it, they did need to know. Seattle isn’t regarded as a big church-going area, but because I had volunteered to tutor ESL that day, and I went to St. James Cathedral on First Hill. I wanted to explain in person that I wouldn’t be leading a session. My student was the mother of a toddler, and we usually brought our little ones to play together while we worked on a lesson. In fact, she only was stopping by to tell me she had another appointment and couldn’t meet. New York was far away for us. My little daughter and I walked outside, and then went in a side door of the Cathedral. They were getting ready for mass. It was perhaps an instinctive response– this is a place to go when one doesn’t know what to do. When we left the Cathedral, we walked a block toward Madison Street, and my heart was touched with amazement at what we saw. There were more than a hundred people standing in absolute silence. They formed a long line from the front door of the Puget Sound Blood Center, down the walkway and around the corner continuing a long way down the sidewalk. They solemnly were waiting to donate blood. In Seattle, sometimes our holy communion looks different from other traditions, but it is all part of our love. As the season changes, I’m reminded of conversations with those beginning new jobs, starting classes, and adding new activities. September feels like the right time to let oneself be more open to change. Seattle is changing and growing quickly, and we have to find new ways to move, explore, and enjoy our places and experiences.